3D printing has already revolutionised design and development. 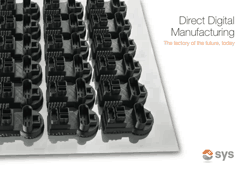 Now Direct Digital Manufacturing (DDM) is utilising additive technology in the manufacturing of final components. DDM is particularly advantageous for small batch production or mass customisation. However, where large volumes are involved, direct digital manufacturing (DDM) can still have a significant impact. This is because the technology is perfect for the manufacturing of tooling for: moulds, form, assembly and inspection.